and enclosures. It consists of a pin, firmly mounted on a high quality self-adhesive base. After the self-adhesive hangers are installed, the insulation is impaled over the spindle & secured with a self-locking washer. 12ga ( 0.106 " ) 2 " square w / tape 1 "
12ga ( 0.106 " ) 2 " square w / tape 1 - 5 / 8 "
12ga ( 0.106 " ) 2 " square w / tape 2 "
12ga ( 0.106 " ) 2 " square w / tape 2 - 1 / 2"
12ga ( 0.106 " ) 2 " square w / tape 3 - 1 / 2"
12ga ( 0.106 " ) 2 " square w / tape 4 - 1 / 2"
12ga ( 0.106 " ) 2 " square w / tape 5 - 1 / 2"
12ga ( 0.106 " ) 2 " square w / tape 6 - 1 / 2"
12ga ( 0.106 " ) 2 " square w / tape 8 "
Packaging: 1,000 pcs/ctn up to 2-1/2"
500 pcs/ctn up to 8"
Remove the release paper from the base plate and apply hanger to a suitable flat surface. that the release paper not be removed until ready to apply the hanger. Insulation may be applied immediately after properly securing the hanger. 1. insulation pin length less than 65mm, 1000pcs per carton, 64 cartons per pallets. 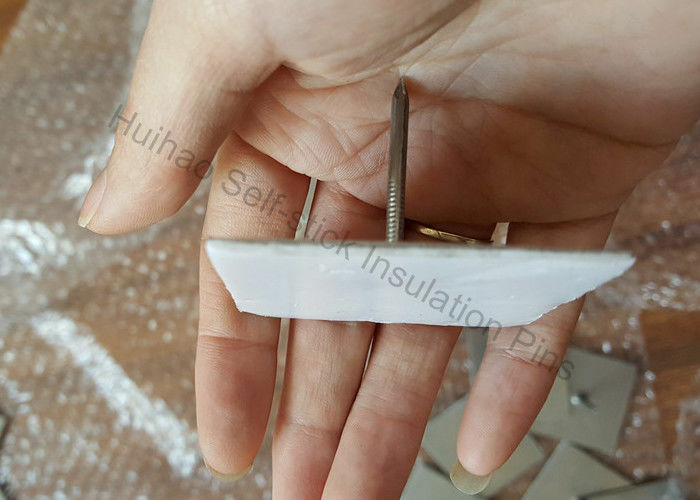 2. insulation pins length 70mm-120mm, 500pcs per cartons,64 cartons per pallets. 3. insulation pins length 125mm-250mm, 250 pcs per cartons, 64 cartons per pallets. The perforated base insulation hangers are designed to fix efficiently insulation concrete and any other rough surfaces. 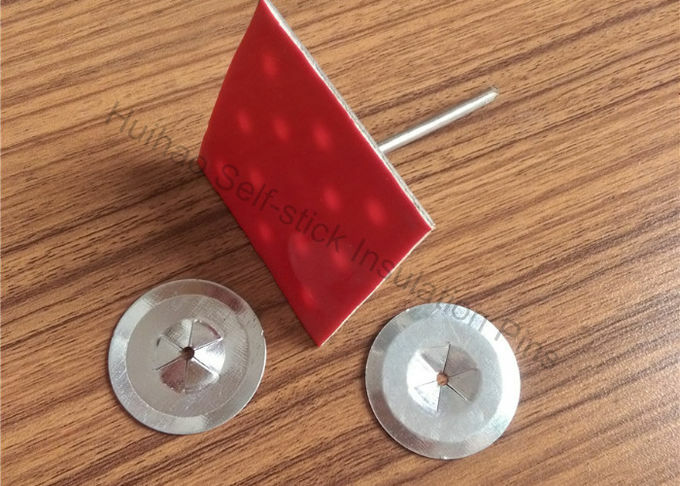 It consists of a pin, firmly mounted on a perforated base. 12ga ( 0.106 " ) 2 " square 1 "
12ga ( 0.106 " ) 2 " square 1 - 5 / 8"
12ga ( 0.106 " ) 2 " square 2 "
12ga ( 0.106 " ) 2 " square 2 - 1 / 2"
12ga ( 0.106 " ) 2 " square 3 - 1 / 2"
12ga ( 0.106 " ) 2 " square 4 - 1 / 2"
12ga ( 0.106 " ) 2 " square 5 - 1 / 2"
12ga ( 0.106 " ) 2 " square 6 - 1 / 2"
12ga ( 0.106 " ) 2 " square 8 "
12ga ( 0.106 " ) 2 " square 8 - 1 / 2"
12ga ( 0.106 " ) 2 " square 9 - 1 / 2"
12ga ( 0.106 " ) 2 " square 10 - 1 / 2"
12ga ( 0.106 " ) 2 " square 12 "